Ok, ok. I'm taking the easy way out, but ya'll should know, I'm so far behind on everything - in work, in life, in getting timely information from the Paley Center. Moving on. So when my friend brought these next three magnets back for me from the Masters, I took it as a sign from on high that I should use Amen Corner as the last three magnets that I'm behind! Tomorrow we'll be back in real time! Amen to that! 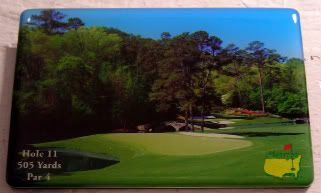 Augusta National Golf Club has a storied history that you can find here, but it was founded in 1934 by Bobby Jones and Clifford Roberts on the site of an old plantation in Georgia. The course itself is considered one of the most beautiful in the world. So this magnet is Hole 11, a par 4 that's about 505 yards. It's the most difficult according to the PGA TOUR. It's the beginning of Amen Corner in the southeast corner of the course, made up of the second shot at 11, all of the 12th, and then the tee shot at 13. I love that Hole 11 is called the White Dogwood because of all the White Dogwoods lining the fairway, that's sweet. Also, seriously. How is this course not in North Carolina with all those dogwoods! *Amen Corner, dubbed so by golfer/writer Herbert Warren Wind in 1958. There's this whole debate around it, but supposedly, it was based on a song he knew as a kid at Yale, Shoutin' in that Amen Corner!